When I have started each year, for at least the last five years, I have started with a list of things I would like to accomplish in that year. The number of accomplishments on that list corresponds to the year that it is, like 18 things in 2018, 17 in 2017, etc. It turns out I have yet to accomplish all of the things on the list that I have set out to accomplish in any of those years. So last year I started a tradition to recap at the beginning of a new year the things that I did accomplish in the previous year- some of them were on my list of things I aimed to accomplish, while others were not. So here are the 18 things I did accomplish in 2018. I paid off my third loan. I’ve paid off 3/4 of my debt on my own and I’m really proud of that. I completed half of my requirements for graduate school and maintained a 3.5 GPA even though I was wedding planning and working full time while attending school. I read 64 books and got closer to my life goal of reading 1,000 books. I beat my addiction to calorie counting and learned to eat when I’m hungry. I said yes to my best friend and we planned a lot of our big day together. I cannot wait to marry him and share those moments with our friends and family! Only 166 days! I accepted a new job and left the comfort of my first big girl job. I went to Miss America for the first time (and got to watch one of my dear friends win!!). I learned to stomach tequila. Okay, that one may sound sketchy, but for a while I could not even smell it in my vicinity without being sick. So thanks to the best bridal shower for a friend, for helping me get over that one. I learned to walk away from friendships I wanted to maintain when that friendship was not healthy. 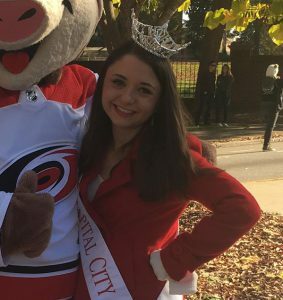 I finished my year as Miss Capital City, and even though I did not get another chance to compete at Miss North Carolina, I was so proud of the way I represented that title, and all of the work I put into making a difference through my platform. I completed my graduate school internship at the Gaston County Museum. I learned a lot, and I gained new members of my family. I had worked with a lot of nonprofits before, but I had never done so with an official title, or for a prolonged amount of time leading up to an event that I helped bring to fruition, and I was so privileged to do that in 2018- and we raised thousands of dollars in the process! I judged and presented awards at National History Day, as Miss Capital City and as a student, at UNCC. I made my first bulletin board. I taught a new class where I was able to create the curriculum and actually had fun even though it was really hard. I made it to my five year recovery birthday. There’s a lot I wanted to do in 2018 that I did not do, but that’s okay. I plan to write again in a few days letting everyone know the plan for 2019, and the list of things to accomplish and share some news. For now, it’s off to start this semester of graduate school.